10 a.m.-11 a.m. : site cleaning. Four beach personnel helped to take away FDGS found-and-arranged items off the most south launch-flight-run path: four large wood logs, six boards that had each two nails in them sticking out ready for nasty punctures, a door-frame part, and two BBQ skewers set in sand ready to pierce beach goers and landing recreational hang glider pilots. The launch and flight run is rarely, if ever used by the concessionaires or recreational hang glider pilots; but now the path is cleared of hazards. At about 5 p.m. BobK, JoeF, and Frank flew at the cleared most-south site. The site is south of where the concessionaire mostly gives lessons. Our flights were substantial. 12 noon to 1:30 a Condor 330 owned by Frank Colver was hatched fully by combine efforts of Frank, BobK, and JoeF. Frank modified the foam on the base bar to allow the wheels that he constructed for the beach sand; the mod worked well. Then flying ensued; between the three pilots about 45 take offs, 45 cruise flights, and 45 landings were made. Each take off had its peculiar lessons and experience. Each flight through the clean fresh air had its special challenges. Each landing gave a neat unique fun experience. All were refreshing the spirit. About 7:30 p.m.: The putting to bed of the Condor 330 had its challenges and little lessons. Some things were found that will be getting Frank's special shop attention. Plugs for the LE tubes for semi-short pack is one project. Another: One flying wire was with a significant scuff stemming from shipping from Michigan state or prior use in Michigan; we taped the section to identify it for later attention. The helper bungee for the rear kingpost wire will be getting some logistical attention. The keel rib batten front cradling will get some Frank ingenuity. A tip bag seems to be missing. A helper rubber strap might be found to aid in keeping the batten camber sectors together for bagging. We celebrated with an evening meal and made some plans further organization of FDGS. My trek for the day was enriching and joyful: 6 a.m. packed; 7 a.m. began walk to bus; bus; train; bus; walk; arrived at Dockweiler at 10 a.m. Three hours going. At day's end the return transport after BobK left me at Douglas Station (train: Green Line) was 1 1/2 hr, half the going time. (Green Line train to Harbor Freeway bus Silver Line 910 to CSULA). It was a special dinner; we gave thanks to Frank for sharing his new Condor 330. Earlier in the day we signed Frank's waiver concerning the sharing of his wings and things. We hold him harmless for anything that might happen to us stemming from interfacing with his wings and things. Some one-way soaring was in some of our flights. Many spectators. And we deeply answered many questions. Rodney took some key flight videos and will be sending them to Frank. Also an old timer hang glider visitor smiled and indicated he would be visiting again; I am guessing he will be applying for a RHG permit; he has already significant hang glider skills; the visitor had competed against Joe Greblo in a hang glider competition someplace and ended with more points that Joe Greblo. Last edited by JoeF on Tue Aug 15, 2017 12:23 pm, edited 2 times in total. Good and detailed FFR (Free Flying Report) Joe. Great diary and a nice opening report!! 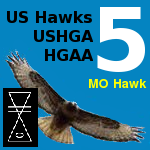 Also, I just welcomed Bill McGinnis from UC San Diego in the "Hello US Hawks" topic, and I posted a few pictures from yesterday's flying there. If you read Bill's post, you'll see that he goes way back in the sport (1973). He's currently re-entering under John Heiney's instruction. I invited Bill to join us some time, and I directed him to this topic. I hope Frank can find time to post some better pictures than I had from my camera. Maybe a few frames or links to vimeo to augment Joe's report. Mostly, thanks to both of you for a great day of flying. The future looks very bright for the Friends of Dockweiler!!! I didn't have any good pics of my first flight in my new (to me) WW Condor 330. Here are some snapshots from the video of my second flight. Frank Colver fathered the birthing of another Condor, a 225. Bob Kuczewski, site-opener leader, was first to fly the Condor 225. Faust followed. Then Frank took his initial flight which went well; video will be someplace available. Two wind tells were hung and later taken down. Frank broke a new-era record: 7 flights today! That number matches his pioneering USHGA membership number. Congratulations, Frank. His flights gave him many experiences spicing the fun day. Bob and Faust each had approximately 20 launches, 20 glides, and 20 landings. No two flights of the 47 were identical; each had special adventures. No crashes. No injuries. Full day of exercise, fraternity, and learning. Backdrop: wonderful sea state ever changing and delighting and peace-giving. Today was the first day in the new Dockweiler recreational hang gliding era where two wings were active; the second one was Bob's Falcon 3 195. Bob and Joe flew both wings of the day. Frank intimated that the excellent-condition Condor 225 might be available. Interested? We three explored the hang point carefully on the Condor 225 and traced the little flight nuances from changing the setting. The Friends of Dockweiler and USHawks cleaned litter from Imperial Blvd park entry to the south launch of the hang gliding site. A US Hawk also detailed a park hazard to the lifeguard at Imperial Blvd. ; there are four steel buoys set as sculpture to give facade to the park's entry; the most east buoy has a rusted and sharp and broker rigging eye on its site just where child may climb and pass; the sharp projection is a hazard waiting to severely gash someone's leg. The lifeguard said he will report the matter to Beaches & Harbor. It was evident that our directing many people to HG instruction may be important to the concession. We answered questions about HG. 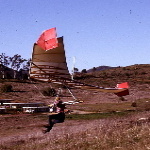 Ed Vasquez (first flown HG in Zephyr in New York in 1974; early Glider Rider reader; much HG experience; once best in a competition the current owner of Windsports, cyclist) has now shown two times at Dockweiler new-era recreational HG days. He will be on Aug. 29, 2017, starting communications aiming at obtaining an approved permit for recreational hang gliding under management of Los Angeles County Beaches & Harbor. Burrito and taco meal after sunset let us review some Dockweiler evolution concerns. What ifs.... ? Otto meet next year? Tie-down concerns. Soaring matters. Assuring good practices? New permit applications? Some HG political issues? Coming changes at Windsports International? Thanks to Bob for a car lift to Douglas train station where paper-airplane sculpture is featured. While Faust was waiting for the train at the elevated waiting platform, he pulled out a special dynamic wing and kited it; a cyclist: "That's cool!" The day brought soothing deep exercise, mediation, learning, fun flying. The recreation gives foundation for doing our other works in the community. Thanks for the report, Joe. Here is the link to my Vimeo clip showing my 1st and last flights of the day. In between was the discovery, when I took my hands off the bar & it stalled, that the hang point we were using trimmed the glider too slow, leading to some directional instability and slow turn recovery response. After moving the attachment point about 1 1/2 inches forward the flight characteristics improved immensely. As usual, BobK and JoeF were a big help to me physically and mentally, thanks Guys! Super pleasant HG day in TWO SESSIONS marked by a needed nap in the shade of the Falcon 3 195, courtesy of Torrey Hawks-shirt-wearing US Hawks Bob Kuczewski. First session in 8 to 9 mph (est.) cool welcome breeze from a distant horizon; sea state: mild, maybe 3% white capping. Low clouds streaming gently without complexity. Before the nap estimated 15 flights each: 15 take-off, 15 unique glides, and 15 ever-exciting landings. True joy to leave terra firma and be airborne with some bird-like control and then meet Earth firma again. Second session: about 10 flights each. BobK and JoeF were the permittees. We changed launch points and envisioned some things to try soon. One idea: smooth the sand incline at one of the launches; set a taut run fabric; and see how that goes. In three interludes JoeF flew two kinds of string kites. Seagulls were ever helpful as companions whether they were flying or not. Ed Vasquez was post-session given a copy of the RHG waiver. Glider Suite at Borland was visited by BobK. He comes from San Diego to the neat Los Angeles recreational hang glider site at Dockweiler. A distance recreational playful contest occurred in the first session and then more seriously in the second session; BobK set the day's world record for the site with the wing at hand. Congratulations, Bob Kuczewski, for your leadership in opening the RHG site at Dockweiler in the new era, and for setting the record for the day for distance by keen management of the potential energy and the energy you added from your launch technique from the little Faust Hill. We flew right up to sunset. With the sun below the horizon, a rest was taken before putting the bird away in its blanket. A difficult zippering in the wing's stow bag challenged us; BobK had the magic solution. Zip ... the wing was put to rest. JoeF did one deliberate wheel landing in prone while having very low ground speed while still looking forward to the further distance mark set by BobK. Many questions by spectators were answered. Several serious quests were directed to Windsports for instruction opportunities. Some glass bottles and other debris were placed in the sanitation containers. Three pelicans graced our view at the end of the fun day of hang gliding. We didn't get a video of every flight, but I counted 59 flights in my video log. I know that the first flight wasn't recorded, so that's a minimum of 60 flights. I'd guess the actual number to be in the mid-60's. I'll try to post some snapshots this evening. It was a super day!!! With so many pictures, I had to write a program to arrange them on pages. That was a lot of flying!!! Editor's Note: The original photos in this post were replaced by slightly larger versions with a black background on September 7th, 2017. The ordering of the photos was also corrected to match the sequence in which they were taken.